I have loved this stamp from the moment I saw it and have been inspired by other cards on here. I used the marker technique to ink the stamp, then spritzed with some water and stamped on watercolour paper. This is a small 4" x 4" card, I love making the small size. 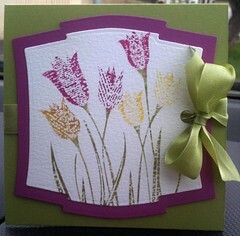 The lovely seam binding is from Stampin' Up.